G-DRAGON’s art exhibition ‘PEACEMINUSONE’ finally only one day ahead! G-DRAGON who always creates a new trend has become a star artist now! STARCAST unveils behind cuts taken at the exhibition for the first time. G-DRAGON visiting the exhibition hall where art pieces are being installed for the exhibition. G-DRAGON gives you some tips to best enjoy the exhibition. Would you come with us to look around the hall? (NON) FICTION MUSEUM is the space you come across first at the exhibition hall! This is a room for the time and space of G-DRAGON alone. As well as other objects that inspire G-DRAGON are gathered together. Objects beloved by G-DRAGON, shall we go and m in advance? The quintessence of simple design, whose name itself is even simple! Pieces of G-DRAGON’s personal collection other than the above-mentioned are placed in every corner of the hall! Is a world created by contemporary artists including Bang & Lee, Son Dong-Hyun, and others. Is a space of revolution, which has an infinite potential. In here, visitors can become G-DRAGON on stage, his fan out of the stage, or sit on the director’s chair, moving themselves into different positions. What would it be like if “hip-hop” is painted in a drawing? Do you think of graffiti or action painting drawn by street artists? Artist Song Dong-Hyun completed the portrait of hip-hop music in the technic of Oriental painting. Son’s PEACEMINUSONE is a world without a fixed answer! G-DRAGON who expresses his real feelings in his music! Is he a grown-up or a child? To interpret PEACEMINUSONE as a world filled with innocence and courage! What is G-DRAGON in that world like? Who confronts himself in a mere dream to vanish when he opens his eyes! Along with Bang & Lee, Son Dong-Hyun, Michael Scoggins, Jin Ki-Jong, and other five artists who have communicated with G-DRAGON for more than a year, five famous foreign media artists including Davide Quayola and Universal Everything! Aren’t you excited about it? Find Out More @ NAVER modoo! What is the piece of work behind G-DRAGON walking across the hall? To be held from June 9 to August 23. Let’s see at Seoul Museum of Art~? [OSEN=??? ??] It was a real perfect match. Idol group BIGBANG showed an unprecedented synergy in SBS TV’s real variety show “I Love Sunday – Running Man” (“Running Man”). “Running Man” prepared more-than-ever exciting race, and BIGBANG live up to high expectations on them, by doing their best without being afraid of looking funny. That made the viewership rating of the show enter a double digit, and viewers are showing enthusiastic responses to BIGBANG’s performance in the show. According to viewership-rating survey company Nielson Korea on 8 this month, “Running Man” of SBS TV’s “I Love Sunday” aired on the 7 recorded 10.7% of viewership rating (nationwide). The record was 0.4% higher than last week’s rating. Notably, the scenes of gate 1 and gate 2 of final mission “Time-Track Racing” recorded 13.22% for instantaneous maximum viewership rating, showing an unprecedented success. BIGBANG has shown only charismatic performances on the stage so far, but in “Running Man”, they made viewers burst into big laughter, doing their best in every game regardless of how funny they look. Plus, the psychological competition between the “Running Man” members led by Yoo Jae-Suk and the team of BIGBANG and Kim Jong-Guk made the race all the more exciting and interesting. Their harmony with Yoo Jae-Suk was especially impressive. BIGBANG has co-acted with Yoo Jae-Suk for several times in MBC’s “The Infinite Challenge” and KBS’s “Happy Together”. So, BIGBANG members could engage in the race even more comfortably. Yoo began conversation with BIGBANG by talking about mutual memories, and that made DAESUNG who appeared in “The Family Has Come” with Yoo boast every piece of his wit and humor. BIGBANG did not refrain from being funny from the first mission called “A Cuckoo Cuckoos Cuckoos”. It was a mission where the members had to walk through rotating gears, pass through a vinyl wrap, and say “cuckoo” for the time they spent to pass the gears and wrap. T.O.P and TAEYANG first penetrated through the wrap. The two caught the eyes by displaying their will to win regardless of their faces looking distorted. Notably, DAESUNG did his best to penetrate through the wrap, even though he was afraid of his girl fans being disappointed by his funny face. In a water basketball match, BIGBANG members showed off their quick movements. The five BIGBANG members and Kim Jong-Guk did very well in the beginning, but soon faced difficulty because of the “Running Man” team’s fouls. Notably, TAEYANG’s pants were taken off by Lee Gwang-Soo and Ji Suk-Jin, so he could not get out of the water for some time, which created a funny scene. The sweaty missions continued. The highlight of the day was “Time-Track Racing”. The members had to complete four missions while circling circuits. Sub-missions such as overturning a glass after drinking water in it, running on abacus, flag-pole teamwork, and unloading a bundle on the wall were given, and BIGBANG members won those missions as well, actively playing the game. Their will for victory left a deep impression. 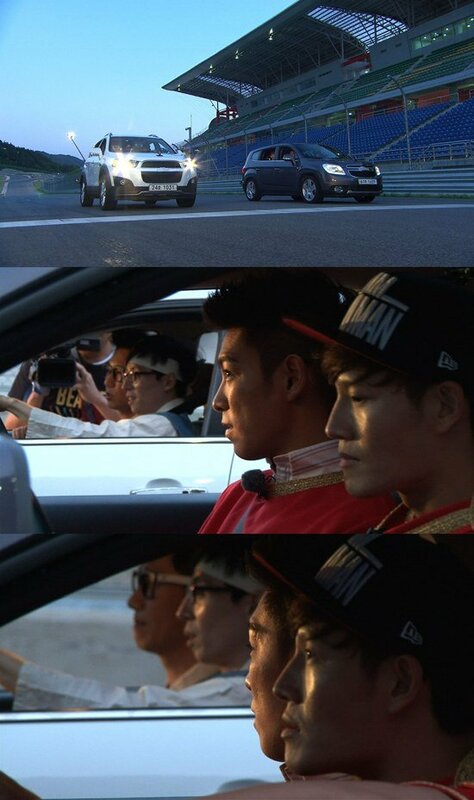 “Running Man” members also closely chased BIGBANG, doing their best. Eventually, BIGBANG became the final winner and said, “We really enjoyed the race. It was so good to meet all the ‘Running Man’ members and play with them after a long time. We’re willing to appear in this show again when you call us”. [????? = ?? ??] BIGBANG’s G-DRAGON expressed his feelings on becoming the center of an exhibition. The title “PEACEMINUSONE: Beyond the Stage” is another name for the world that GD imagines—he idealizes PEACE but lives in a world deficient (MINUS) of it. It is the difference (ONE) between reality and the ideal world. The exhibition displays a total of 200 artwork including sculpture, installation, photographs and painting work that were born from the artistic solidarity formed between GD and the artists. The exhibition will be held overseas as well, going from Seoul to Shanghai, Singapore and more, to be introduced to international audience. [??????=??? ??] BIGBANG’s G-DRAGON expressed his feelings on becoming the center of an exhibition. [OSEN=??? ??] GD commented, “I have this huge fantasy for beautiful things,” explaining the reason for holding the exhibition. GD was present at the press conference at the Seoul Museum of Art for his exhibition titled “PEACEMINUSONE: Beyond the Stage” on June 8. The Seoul Museum of Art will house his exhibition from July 9 to August 23. GD will be in charge of creating a junction between pop culture and contemporary art by collaborating with domestic and foreign artists. The exhibition cuts across fashion, design and music, led by GD who is deemed as the leader of pop culture. His vision for this culture is expressed by the language of visual art, which moves to a different realm outside of music. He aims to make and do contemporary art more easily while holding an exhibition where a wide range of population can enjoy. The title “PEACEMINUSONE: Beyond the Stage” is another name for the world that GD imagines—he idealizes PEACE but lives in a world deficient (MINUS) of it. It is the junction (ONE) between reality and the ideal world. [????? = ?? ??] In the midst of the hype of GD becoming the center of an art exhibition, Kim Hong Hee, the director of Seoul Museum of Art, emphasized her intention. The press conference of the exhibition “PEACEMINUSONE: Beyond the Stage” was held at Seoul Museum of Art. Kim commented, “Collaboration with GD was an experiment but I felt the pressure. Such challenges are accompanied by risks, but without a challenge changes can never be made.” She expressed her anticipation she has for contemporary art. [enews24=??? ??] The “giant” of the music industry, YG Entertainment, is expanding itself in almost an intimidating way. Apart form musicians, the agency is also home to actors like CHA SEUNG WON, CHOI JI WOO and JANG HYUN SUNG, having an impact on the movie world. Recently it offered a spot to a scriptwriter YOO BYUNG JAE and a comedian AHN YONG MI, surprising the public. And now YG is using the fame of its musician to push forward collaboration with the art circle, expanding its influence to all kinds of realms. A press conference was held at the Seoul Museum of Art for the exhibition titled “PEACEMINUSONE: Beyond the Stage” in the evening of June 8. The exhibition is meaningful in the sense that GD’s cultural vision is expressed through the language of visual art, eliminating the boundary between different genres. He helps make art more approachable for the public, and also the entire range of population to relate and enjoy. GD, who has a huge number of fans as a global artist, shows his determination to expand his influence to a new realm by collaborating with contemporary artists. The exhibition displays a total of 200 artwork including sculpture, installation, photographs and painting work that were born from the artistic solidarity formed between GD and the artists. The exhibition will be held overseas as well, going from Seoul to Shanghai, Singapore and more, to be introduced to international audience. Exhibition in Seoul will be held from July 9 to August 23. [OSEN Focus] Why was GD the One for Contemporary Art? A press conference was held on the 1st floor of Seoul Museum of Art under the title “PEACEMINUSONE: Beyond the Stage” on June 8. Like her comment, collaborating with GD would have been big pressure. But there is one solid reason she had to go hand in hand with him. He stands in the center of pop culture, and he is a living art as we can see from his composing of songs and fashion sense. He is almost the only musician who encompasses the taste for general public, artistic talents and an enormous influence on pop culture. He added, ““When I announced the launch of my exhibition many had questions and curiosity for it. I am a musician and a pop artist. “I would like to use this opportunity to collaborate with artists in the realm of visual art to have an exhibition that crosses over to contemporary art from the genre of music. I would like to be the bridge to introduce domestic artists to the public who are not familiar with art or who find art unapproachable,” he continued. This is meaningful as GD will be cutting across all the boundaries of fashion, design, music and more by expressing his cultural vision in the language of contemporary art. This will help art become more approachable while making an opportunity for the entire range of population to enjoy art. YG Entertainment on June 8 said that the track topped 9 major weekly charts on Melon, Olleh, Genie, Daum, Naver and more. Apart from this, BIGBANG’s other title track “WE LIKE 2 PARTY” occupied the second slot on Melon, Olleh, Genie, Daum, NAver, Cyworld and Mnet. “LOSER” and BAE BAE” unveiled last month are also ranked within the top 10 of charts. They are performing equally well on daily charts, including on Melon, Olleh, Genie, Naver, Daum and more, totaling 9 charts. “BANG BANG BANG” is showing incredible power by topping daily charts for 7 days in a row since release. Their music videos are attracting much attention as well. “BANG BANG BANG” hit 12.3 million views in the morning of June 8 while “WE LIKE 2 PARTY” attracted 5.15 million views. The dance practice video of “BANG BANG BANG” hit 2.36 million views. The two teams play basketball for their second game, but since this is “Running Man,” it’s no ordinary match – the nets are set up in the river and the ball is made of sponge. Things go fairly smoothly in the beginning, until the score gets tight and some players resort to some unsportsmanlike methods of getting the upper hand. In particular, the “Running Man” team is determined to try to get the BIGBANG members and Kim Jong Kook out of the game. Lee Kwang Soo, Yoo Jae Suk, and Song Ji Hyo wrestle Kim Jong Kook into the shallow water. Yoo Jae Suk and Lee Kwang Soo manage to take his shorts off, and Yoo Jae Suk flings them onto the beach – leaving Kim Jong Kook stuck hiding his legs in the water and unable to join the game. Taeyang is their next target, and the “Running Man” team overpowers him quickly and takes his shorts off. They throw them onto the shore too, leaving his legs bare. Kim Jong Kook takes it all sitting down for a while as he kneels in the water to hide his legs, but when the members get him angry he decides to rejoin the game with his jacket tied around his waist. Lee Kwang Soo and Yoo Jae Suk are determined to get Kim Jong Kook out of the game though… and soon they’ve attacked him again and are stripping off his underwear and shirt! Kim Jong Kook is left naked and furious with only his shoes on, and tries to cover himself up with his jacket. Watch June 7's episode of “Running Man” to see what the two tricksters do with his underwear, and how Kim Jong Kook reacts! On June 7's much anticipated episode of “Running Man,” the guys of BIGBANG join the show’s regular cast members for a historically-themed race. For the show, BIGBANG gets dressed up like Roman gladiators with Kim Jong Kook, while the rest of the cast of “Running Man” is dressed as wealthy merchants from the Joseon dynasty. While everyone is saying hello to each other in the opening, Yoo Jae Suk mentions that Haha envies G-Dragon most of all. He then turns to G-Dragon and says, “Please be my son’s godfather!” Haha and his wife Byul have a young son named Dream, who is just about two years old. 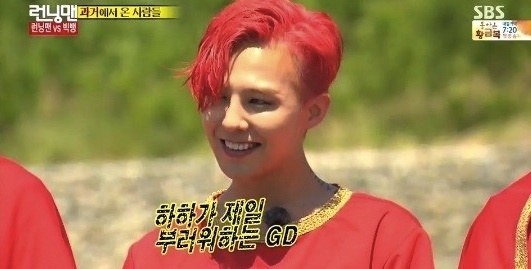 G-Dragon just laughs along with everyone else at Haha’s request. “Make my son like you!” yells Haha. Be sure to watch this week’s episode for more! The two songs, which were released on June 1, have been both number on on different charts for the last six days. “BANG BANG BANG” is number one on the daily charts on Melon, Genie, Bugs, Mnet, Olleh, Naver Music, and Soribada, while “We Like 2 Party” is topping the daily charts on Daum Music and Cyworld Music. BIGBANG has most recently appeared on the June 7 episode of SBS‘ “Running Man” as part of their promotional activities. On June 5, BIGBANG made an appearance on “Yoo Hee Yeol’s Sketchbook,” their first time on the show as a full group. During their interview after their performance of “BAE BAE,” Yoo Hee Yeol asks what the group members are good at. 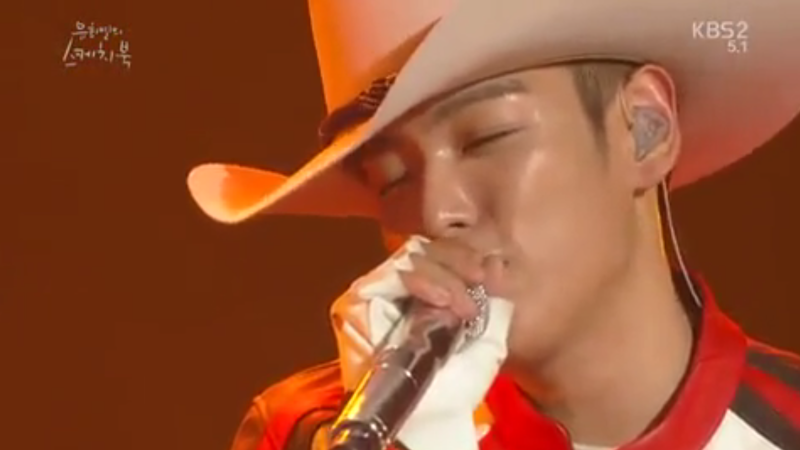 The members then ask T.O.P to sing the song “Please” by the band Deulgukhwa (vocals: Jeon In Kwon). “So you can overcome it here,” says Taeyang, and Yoo Hee Yeol agrees, offering to play piano for T.O.P while he sings. 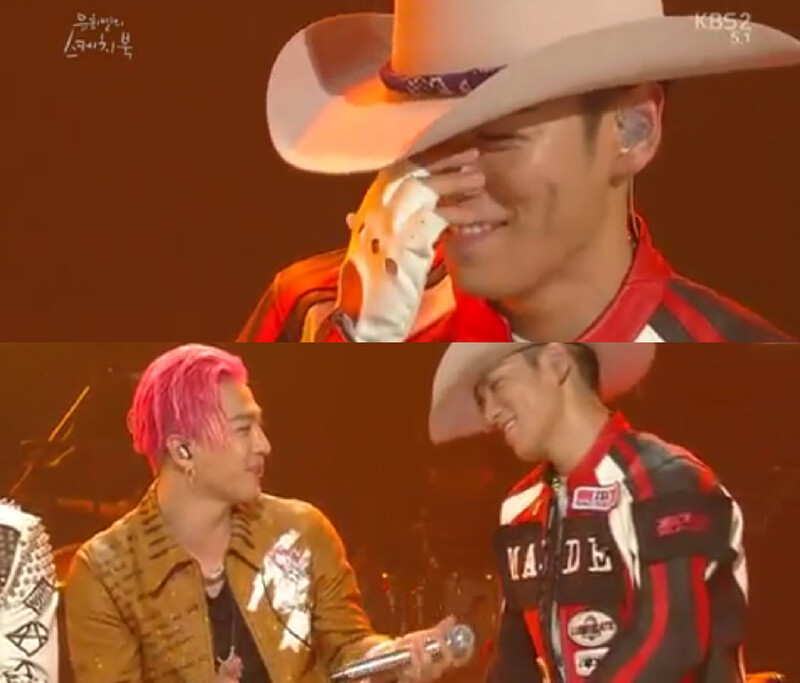 While singing (Deulgukhwa’s “Only That Is My World“), however, T.O.P gets singing stage fright and is unable to continue, although Taeyang tries to help him out a little bit. Music mogul Yang Hyun Suk has released a photo of BIGBANG members Taeyang and G-Dragon together when the two were young teenagers. 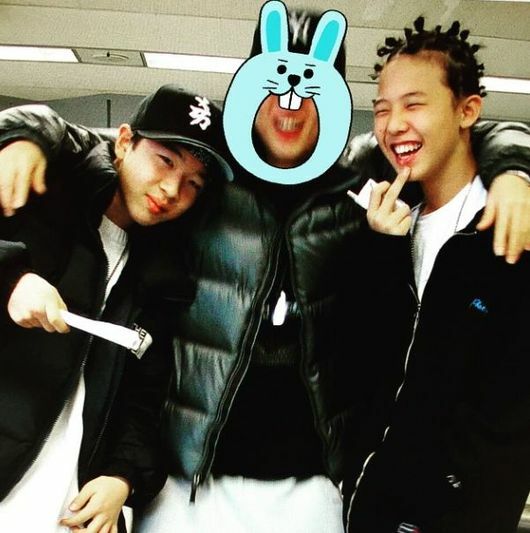 Uploading the photo to his personal Instagram on June 5, Yang Hyun Suk also wrote the caption, “Once upon a time.” In the photo, G-Dragon can be seen smiling broadly with his hip-hop style haircut. On the left, a fresh-faced Taeyang smiles as he looks happily into the camera. Meanwhile, BIGBANG is currently in the midst of their “Made” project, where it releases new singles on the first of each month. The released songs will then be included in the group’s comeback album, “Made,” which is set for release in September. It previously released “Loser” and “Bae Bae” on May 1, and followed that up by releasing “Bang Bang Bang” and “We Like 2 Party” on the first of this month. The two pillars of “RunningMan,” Yoo Jae Suk and Kim Jong Kook, will be engaging in a fierce race. A preview of the upcoming June 7 episode of SBS‘s “Running Man” with all five members of BIGBANG was revealed, garnering the interest of viewers. In particular, most of the missions of the episode will take place in a racing stadium. The opening is as impressive as ever as they show off fancy driving skills. However, Yoo Jae Suk is revealed to be dressed up as a man from the Joseon Dynasty and Kim Jong Kook is dressed up as a swordsman from the Roman Empire. The two of them make fun of each other’s costumes, inciting laughter. They continue to bicker even after the missions begin. Not only do they distract each other in an underwater game, but they also turn the whole set upside down as they fight over pants. The anticipation builds until the final game, which is a car racing mission. You can catch this episode of “Running Man” on June 7. BIGBANG goes back to their roots as they reminisce their training and pre-debut days onYoo Hee Yeol’s Sketchbook. As the group partcipated in the episode filming of Yoo Hee Yeol’s Sketchbook last June 2nd, they members confessed that they experienced the happiest times during the training and early debut part of their careers. After the confession, all five members rushed backstage and got dressed into the outfits they used during their early debut days. BIGBANG managed to bring laughter on set as they introduced their track “Lies,” which was released in 2008, further hyping the audience that the track is predicted to be popular on various college festivals. As they performed, Yoo Hee Yeol joined them for a piano version of the track followed by a rock version. The full episode will air on June 5th. The post BIGBANG transform into rookies as they perform “Lies” on “Yoo Hee Yeol’s Sketchbook” appeared first on Koreaboo. 150602 ???? ???? ? (T.O.P) ???? - ????? ??? from UT.O.PIA on Vimeo. At 12am of June 1, BIGBANG unveiled the second album “A” of the MADE SERIES. The album features “BANG BANG BANG” and “WE LIKE 2 PARTY,” and these two tracks are quite a change from the previous “LOSER” and “BAE BAE.” Fans are truly entertained by BIGBANG’s different colors. “BANG BANG BANG” is said to be an extension of “FANTASTIC BABY” and “LIES,” with fast and powerful beat that leaves a strong impression. It is dynamic yet upbeat, drawing in the listeners. About “BANG BANG BANG,” GD once explained, “The song reminds me of a powerful performance that is associated with BIGBANG. ‘LOSER’ and ‘BAE BAE’ are more of sentimental tracks, while this one is upbeat and fun like ‘FANTASTIC BABY’”. The music video of “BANG BANG BANG” unveiled on the same day as the track itself attracted much attention with its fiery power. BIGBANG with vivid makeup appears in the dark, expressing their performance in such dynamic ways. It is like a blockbuster movie. The video featuring BIGBANG’s charisma and their identity are arousing much attention in the music world. On the other hand, “WE LIKE 2 PARTY” captures BIGBANG in the most candid selves. It is different to “BANG BANG BANG” in the sense that they look nothing like themselves in the other track. 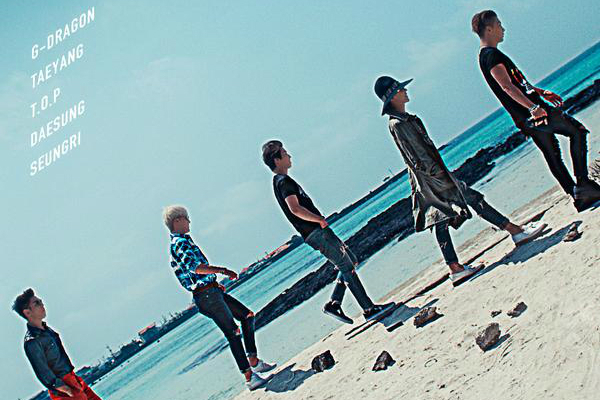 From the famous subway appearance to Jeju island, BIGBANG is featured living their daily lives. They let go of their charisma and chill out in the video, being playful with each other. It is almost child-like. They doodle on DAESUNG’s face while he is fast asleep. All of these look very natural. They unveiled the performance for the first time on Mnet’s M Countdown on June 4. Fans’ reaction was simply mind-blowing. For “BANG BANG BANG” they showcased a sharp and structured choreography with powerful ambience, while for “WE LIKE 2 PARTY” they sang all chilled and relaxed. Both left such powerful impressions. BIGBANG is certainly entertaining the viewers from “LOSER,” “BAE BAE,” “BANG BANG BANG” to “WE LIKE 2 PARTY,” which are all part of the MADE Project. Each song carries different colors. With two more singles left to be unveiled until August, they are attracting much attention already for their future songs. [Fuse] Listen to BIGBANG's Trappy New Banger, "Bang Bang Bang"